The recently refurbished bedrooms and bathrooms look fantastic, as Thomson Gold customers would expect. You can be addured of a very comfortable stay in this friendly and welcoming hotel. Stayed at the Rocamarina in July 2012. The location is out of the way and very quiet. Requested a 'low floor' room - allocated ground floor behind Reception. View of brick wall with main road beyond! No sun, except early in the mornings. High rooms fair better. Didn't ask to change, wasn't worth it for a week. Rooms are spotless and towels changed daily. There are no tea/coffee making facilities in the rooms. Safes are located beside Reception and I have to say, staff were lovely, very polite and helpful. We couldn't complain about the food as it was plentiful and there was a good variety. However, I did wonder if the fruit left from the breakfast was used to make the trifles/desserts for dinner and left over bread from breakfast used to make bread and butter pudding. Reading previous reviews, they seem to have been doing this for years!! No complaints, just an observation of thrifty housekeeping - the desserts were fab and bread and butter pudding (which we had 3 times that week!) went down a treat. Didn't care for having the same table allocated in restaurant, not used with this regimental treatment on holiday. Some like it, some don't. Hotel rule - no towels on sunbeds, however it seems rules are made to be broken. There were the 'saddos' that queued with their beach towels before the pool opened at 9.00 am, to claim a sunbed (as there weren't enough to go round) then they all marched in for breakfast; same ones every day. 'Breakfast time entertainment'! I have to say a highlight of the holiday was seeing 'The Rat Pack' and Circe de Soleil in Palma - not to be missed; booked through Thomson's. There were also the usual nightly quizzes in the hotel but the entertainment wasn't exceptional. I would recommend this hotel if you like a quiet, relaxing holiday lazing around in the sun, however, I personally wouldn't return. a very nice hotel and we would return again. The hotel Rocamarina is a lovely hotel. Maids in every day cleaning your room. Staff very helpful. Hotel was spotless. Meals very good plenty of choice loved the Indian curries. The hotel is in Cala Egos just outside Cala Door.Took the small train into Cala Dor and this was a great way to see the area it was only 7 euros return for me and the wife. Taxi to Cala Dor was only 5.5/6 euros.Rooms were spacious and had all you needed for a great stay. The only down side was the pool it was two small and it didn't have enough sun beds for the people wanting to use it. Rocamarina had a another pool across the road at the tennis courts but you had to pay for a sunbed even if you stay at the hotel. Overall a very nice hotel and we would return again. The hotel Rocamarina is a lovely hotel so clean so comfortable. Our aim to have a good rest and a complete chill was brought to us by the staff, the cooks and the maids; it’s these good people who, I think, made my holiday. So much work goes on behind the scenes, which goes unnoticed and if it wasn’t for these hard working guys and lasses the hotel would suffer. So on that note I say, yes, you got it right. Our room was lovely, the food great, good location, staff fab, didn’t watch evening entertainment. Would come to this hotel again. the hotel is vey clean the staff are very friendly we didnt like the food plenty of choice and a lot of it but very bland cant go below 19 degrees on the air/con,the television has 2 german channels 3 spanish and euro sport which we found quite bizarre as it is an all english hotel the only english channel available is what is on in the tv room which is available in your room but is controlled from reception.ie we were watching the mens tennis s/f in our room and it flipped over to the football would not return to this hotel but liked the area. We requested a quiet holiday resort and this is what we got! Unfortunately I think we must have given the impression that we did not want a too lively hotel, as the clients were of mainly senior years. Apart from this the hotel was lovely, really clean, food was amazing, loved the wide selection and having fresh pancakes, omelettes and scrambled eggs cooked by a chef in front of you in the mornings, lots of choice, great curries in the evening meals, fish, chicken, carvery meats carved in front of you and the sweets were fantastic, little pots of creamy yumminess, crumbles and bread and butter pudding which my husband loved. The spectacle in the mornings of people waiting for the rope to moved so that they could 'race' for a sunbed was mildly entertaining. We sat in a prime spot on the terrace to watch this. not up to other Thomson Gold hotel standards,food is boring and repetitive,the superior rooms overlook the pool and entertainment areas,and are very noisy until 1am when the bar closes. The hotel is exceptionally clean, and the food is superb, although my one criticism would be that it does tend to be a bit samey after a while. The location suited us as it is close to shops, bars & beach. The hotel staff were excellent. Excellent hotel situated in Es Forti about 20 minutes walk from Cala D'or. It is a quiet area, but 3 minutes walk takes you to the shops where there are a good few restauants and some bars. There is, however lots going on in the hotel, there is entertainment every night and whilst most of it is pretty good, there are some nights that are rather lacking. The hotel is spotless, the staff very friendly and helpful, especially reception. The rooms are kept immaculate, my only critiscism about the rooms is the fact that none of them have much of a view, ours, on the ground floor, looked out on a path with shrubs and trees, which hid the road. However, it was not an issue. The food is very good, plenty of it and an amazing variety. 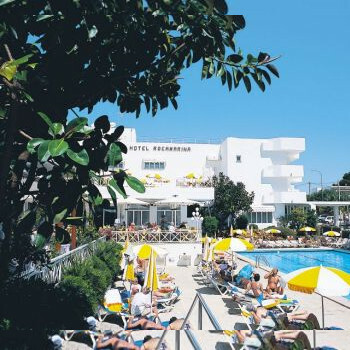 I would recommend the Rocamarina on all counts, with one exception, there is an acute shortage of sun beds..which unfortunately if you are not inclined to queue at 9 am to deposit your towel !!! You are not likely to get one !! The British are just as bad as our European neighbours...and will insist on claiming their sunbed and then going for breakfast...not impressed. But that was my only gripe. So any one going out there, enjoy yourselves. The Thomson team of Dave (your my rep now) Mark, Lorraine and Claire are a cracking bunch and cope brilliantly, they work their socks off...well done guys ! Fantastic hotel. Room and hotel spotless, towels changed everyday, staff very friendly and helpful. We had a standard room that looked over the gardens - you only get a pool view with the superior rooms. But had a look at a superior room and didn't think the extra was worth it - not much difference. The garden view rooms were very private and quiet. Food amazing - plenty of choice, presented and cooked to a high standard. Nothing is too much trouble - wanted scrambled egg for breakfast instead of fried - cooked in front of you in no time at all! Best of all was the bread and butter pudding! Wonder I wasn't charged extra weight on the plane home! Entertainment varied. The Elvis and the teddy bears were amazing - best live band ever! Entertainment alternated from night to night - some good some not so good. Daytime entertainment was around the main pool however we mainly sat at the tennis court pool or the beach so can't really comment. Charged extra for bed by the pool(not the main pool) at the tennis court which was my only complaint as the pool belonged to the hotel! The steak bar by the tennis court was super for lunch. Beach clean, water clear as a bell and we never saw any jelly fish. The resort itself was lovely - no idiots about mainly couples. The marina beautiful, though be careful of the Elton John bar. Charged twice as much for drinks as any other bar! The mini tourist train was well worth the 3 euros return to have a look round resort. Several stops around for you to get on and off. Flight (from Coventry) and transfers very good. Had fantastic time - met some lovely people, start saving for next year!